The length of side tanks was often limited in order to give access to the inside motion. Tanks that ran the full length of the boiler provided greater water capacity and, in this case, cut-outs in the rectangular tank gave access to the motion. Longer side tanks were sometimes tapered downwards at the front to improve forward visibility. Side tanks almost all stopped at, or before, the end of the boiler barrel, with the smokebox protruding ahead. A few designs did reach to the front of the smokebox and these were termed 'flatirons'. The water tank sits on top of the boiler like a saddle sits atop a horse. Usually, the tank is curved in cross-section, although in some cases there were straight sides surmounted by a curve (like an inverted 'U'), or even an ogee shape (a concave arc flowing into a convex arc). 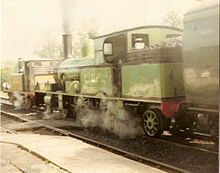 Saddle tanks were a popular arrangement especially for smaller locomotives in industrial use. It gave a greater water supply, but limited the size of the boiler and restricted access to it for cleaning. However, the locomotive has a higher centre of gravity and hence must operate at lower speeds. The driver's vision may also be restricted, again restricting the safe speed. The contractor's locomotive was a small tank locomotive specially adapted for use by civil engineering contractor firms engaged in the building of railways. The locomotives would be used for hauling men, equipment and building materials over temporary railway networks built at the worksite that were frequently re-laid or taken up and moved elsewhere as building work progressed. Contractor's locomotives were usually saddle or well tank types (see above) but required several adaptations to make them suitable for their task. They were built to be as light as possible so they could run over the lightly built temporary rails and had deeply flanged wheels so they did not de-rail on the tracks which were often very uneven. At the same time, they had to be very powerful with good traction as they would often have to haul trains of wagons up very steep gradients, such as the sides of railway embankments or spoil heaps. Many were designed so that large iron ballast blocks could be fitted to the frames when extra weight and traction was required, then removed when it was not. Most had sanding gear fitted to all wheels for maximum traction. Some method of keeping mud and dust from clogging the wheels and brake shoes was also required – this either took the form of scraper bars fitted to the leading edge of the wheels or wheel washer jets supplied from the water tank. To handle long trains of loose-coupled (and often un-sprung) wagons, contractor's locomotives usually had very effective steam-powered brakes. Most lacked a full cab, often only having a front 'spectacle plate'. If a cab was provided it was usually removable along with the chimney, and sometimes the dome, so that the locomotive could be loaded onto a flatbed wagon for transport to new locations by rail whilst remaining within the loading gauge. Varying adhesive weight: As the water in the tanks is used up, the overall adhesive weight of the locomotive decreases, which in turn reduces the train weight the locomotive can pull. Locomotives with low water supplies also typically ride less well as there is less weight on the springs. This page was last edited on 23 April 2019, at 21:48 (UTC).